Here are the scaffolded notes that I use with the Teddy Bear Area Project when teaching Area and Circumference. 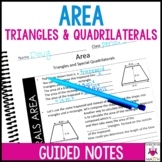 This packet is designed to be used as guided notes to help students find the area of a trapezoid, triangle & parallelogram. These notes will help students solve questions related to standard 6.G.1 . The first two pages are a review to help student understand when a certain formula is needed. 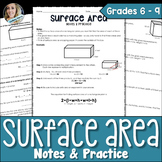 Class notes sheet for 7th grade volume and surface area. Includes sentence frames and introduction problems. 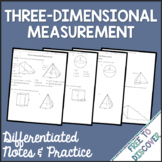 This is a graphic organizer for guided notes on Volume and Surface Area of Prisms and Pyramids. This is useful for content in 7th grade math. Notes that students can cut out and paste in their notebooks. Goes further than just A = L x W and talks about height and base being part of two dimensional shapes. Examples of each are included. Easy to leave for a substitute teacher as well. 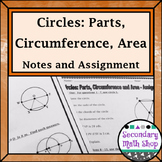 This resource introduces students to finding area of irregular figures as well as finding area of the shaded region of a figure. There is a corresponding homework assignment included! Notes that explain how to find perimeter and area as well as why you might need to find them. Practice problems included as well as an answer key. I put these notes into my students' AVID binders for future reference. 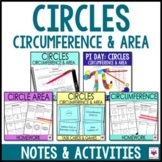 Fun and circular-shaped notes and practice on circle measurements of circumference and area. Includes intro and more challenging questions; also includes "in terms of pi" and decimal calculations. 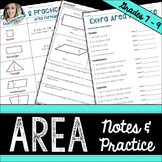 Students can paste these into interactive notebooks for quick references on area and perimeter formulas.